The "Luxo Ball" (or as it's also known by, the "Pixar Ball") debuted in Pixar's 1986 short film Luxo Jr. (directed by John Lasseter) and has since become an instantly recognizable icon for the studio. After being prominent in the original Toy Story, it has also made brief cameo appearances in most of Pixar's feature films (and even some short films) since. At this point, fans of Disney·Pixar expect to find this "Easter Egg" with each new release and have fun trying to spot it (for a full list of where you can find the Luxo ball in each film, check out this definitive list HERE). 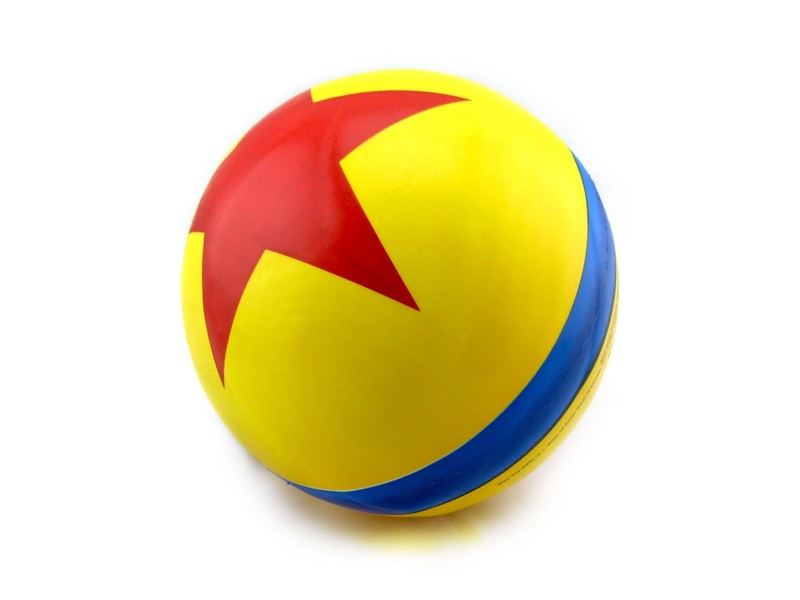 I remember, as I was growing up, wanting a Luxo ball of my own for the longest time. Well, in summer 2010 I got my wish when the Disney Store released their full sized version of the ball! I was so excited when I walked in the store that day and saw it, having no idea it was even out. It has since become nearly impossible to find so, needless to say, I'm so glad I snatched that one right up (see my full post on the Disney Store Luxo Ball HERE). 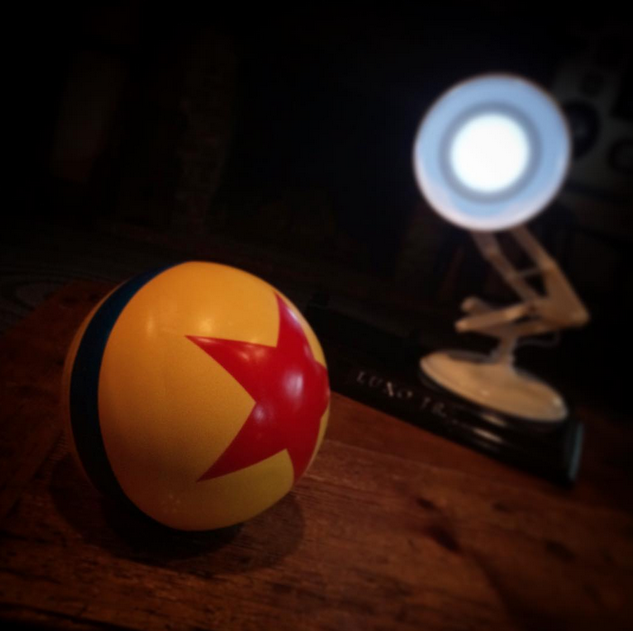 I then found out that there was another Luxo ball out- one exclusive to the Pixar Animation Studios employee store in Emeryville, CA (not opened to the public). I had seen it show up on eBay often, but it always sold for over $100. I was happy enough with my Disney Store version though, so I never planned on paying those high prices for the studio store version (though I wanted it). However, thanks to my good friends T.J. and Julie (from PixarPost.com), I can now say I'm the proud owner of the Pixar Studios store Luxo Ball (seen in the pictures above and below)! I'm very grateful that they picked one up for me when they attended the Inside Out press event at Pixar earlier this year; they're only $5 there at the store. This one is smaller than the Disney Store version (it measures only about 18" in diameter), but is a more movie accurate texture (The Disney Store version is more of a kick ball texture while this one is more of a smooth rubber like in the films). Overall, they're both great for different reasons. I'm so happy and grateful to have both of them now in my collection! UPDATE: Added a third, even more movie accurate version to my collection—check it out HERE. If you're looking to add one of these to your collection, be sure to snag one if you have the chance to go to Pixar Studios. If not, visit eBay using this direct link to view current listings. Good luck on the hunt! Please let me know if you have any questions or comments. Would love to hear from you!